One of the drawbacks of a bicameral parliament in a federal state like India is that victory in a parliamentary election to the Lower House does not necessarily and instantly translate into requisite parliamentary strength to legislate and fulfil the promises made to the people. That is because barring the Congress during the one-party rule era, no government which has come to power at the Centre, has enjoyed instant majority in the Upper House. PM Narendra Modi too has had to cope with this harsh reality, which has led to a legislative logjam in the Upper House. Modi has more than once referred to the manner in which the Opposition in the Upper House has stymied his government’s legislative agenda. Last week while addressing a rally in Bengaluru, he spoke of how the Opposition had blocked the Triple Talaq Bill and the bill to grant constitutional status to the Other Backward Classes (OBC) Commission. The OBC Bill was passed by the Lok Sabha in April 2017 and the Triple Talaq Bill in December last year. Both hit a roadblock in the Upper House. Several prime ministers have had to deal with this problem when they realise that while they have the majority in the Lok Sabha, their adversaries command a majority in the Rajya Sabha. Then begins the arduous task of winning key state elections and improving the ruling party or coalition’s numbers in the Upper House via biennial elections to that House. Many ruling parties or coalitions achieve some success in this regard in two rounds of biennial polls but before the issue is clinched, it’s time for the next Lok Sabha polls. They need to win that election too and also do well in state Assembly polls if they are to attain a majority in both the Houses. For most prime ministers, it becomes futile like the Sisyphean effort to push a boulder up a mountain. Every time Sisyphus got to the top, the boulder tumbled down. Ever since the two Houses were constituted in 1952, the governments run by the Congress have enjoyed clear majority in the Rajya Sabha for most part of their tenures. Three prime ministers—Jawaharlal Nehru, Indira Gandhi and Rajiv Gandhi—have commanded a majority in the Rajya Sabha for much of their years in office. Nehru enjoyed a majority throughout his tenure; Indira and Rajiv had a majority for much of their time in office. Another prime minister who had the requisite numbers in the Upper House was Lal Bahadur Shastri, who succeeded Nehru. He inherited the 166 MPs the party had in this House during Nehru’s death. On the other hand, governments formed by other prime ministers or political parties and coalitions have not been so lucky. P V Narasimha Rao was unique because he not only had a minority in the Rajya Sabha, where his party’s strength hovered between 85 and 99, but he also had a minority (232 MPs) in the Lok Sabha—yet, he dismantled the pseudo-socialist policies of the Nehru-Gandhis and laid the foundation for India to emerge as an economic superpower. Atal Bihari Vajpayee was prime minister for six years, but the strength of the BJP never rose beyond 50 in the Rajya Sabha during his tenure. Most significantly, after 1989, no prime minister has commanded a majority in the Rajya Sabha for almost 30 years. We need to take stock of this reality when a prime minister talks of how his legislative plans are stifled by the Opposition in the Rajya Sabha. This year will see biennial elections to the Rajya Sabha when one-third of the House will retire in a few months. The BJP now has 58 members in this House. With some of its allies in the National Democratic Alliance, it can claim a strength of around 80 in the 245-member House. When Modi became the prime minister, the NDA had 57 MPs in this House. The NDA’s numbers are expected to rise after this round, but it may still fall short of a majority (123). 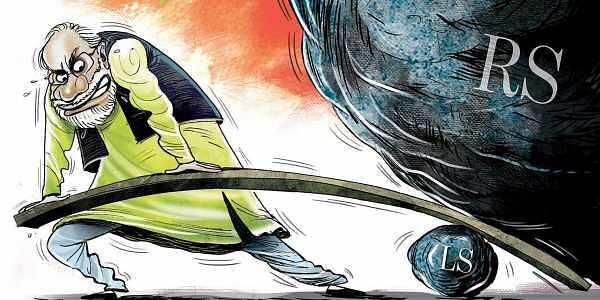 The Modi government’s woes began in 2014 itself when key economic reform measures were stalled during the Winter Session of 2014 in the Rajya Sabha. They were the Coal Mines (Special Provisions) Bill and the Insurance Laws (Amendment) Bill. In April, 2017, the Rajya Sabha blocked the Bill which sought to provide constitutional status to a commission for socially and educationally backward classes. Last month, the OBC bill came back to the Lok Sabha after the Rajya Sabha considered the same and made several amendments. The government tabled the Bill once again in the Lower House and said it wanted the House to negate the amendments made by the Rajya Sabha. So, currently, a political football is on over this bill. The Triple Talaq Bill was cleared by the Lok Sabha on 28 December 2017. When it came before the Rajya Sabha, the Congress raised all kinds of objections and wanted it sent to a select committee. The long and short of it is that two important legislative measures are stalled because the government of the day does not have a majority in the Upper House. When the Constituent Assembly examined this issue, there was overwhelming support for a second chamber. However, the Constitution-makers provided for some contingencies. For example, it was laid down that while both Houses enjoyed equal rights, the Lok Sabha’s opinion would prevail in regard to money bills. Given the problems faced by successive governments in seeing through their legislative measures in the Rajya Sabha, one wonders whether N Gopalaswami Ayyangar, who was a strong votary of the second chamber, failed to foresee what India’s oldest party would do seven decades hence, when he said that they had taken care to ensure that the Rajya Sabha would not prove a clog either to legislation or administration. But this is exactly the problem that Prime Minister Modi is facing today.